[01/28/2016 @ 9:21 PM] Open this itinerary here: Orbitz, CheapTickets, Priceline, Expedia, Travelocity, Hotwire, BookingBuddy. [01/29/2016 @ 1:49 PM] Fare gone. Removing from deal list. United and Air Canada have round-trip flights from Austin to Madrid (MAD) or Barcelona (BCN) for $663 with a connection. Flights from May to August. 90 day advance purchase required. 7 or 9 day minimum stay. See the Flight Details section of this post for example dates. Different booking sites have slightly different prices, availability and routing. 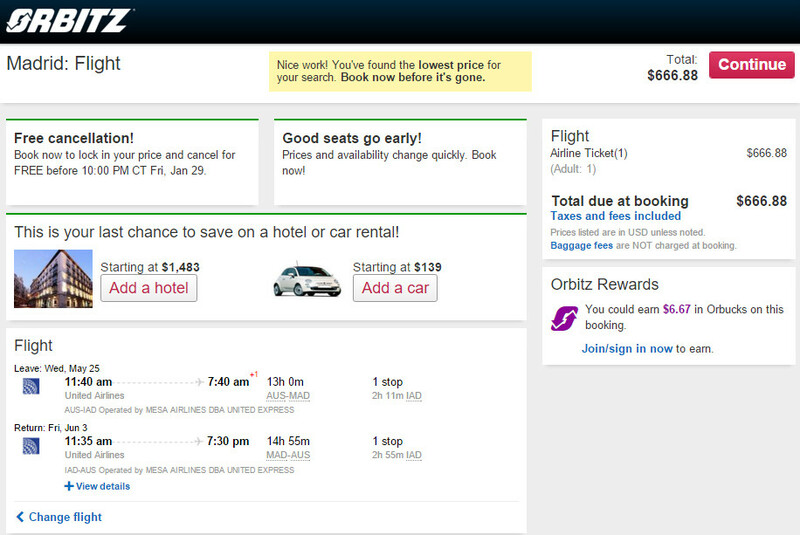 We found the best fare availability on Orbitz. You should always do a quick check on BookingBuddy to compare multiple sites before you finalize your purchase. If you want to see other deals that are still bookable you should use check out the “Bookable Deals” page on our site. It filters out deals that have expired, or have low availability. To save the most money, be sure to make use of the travel coupon codes available at the bottom of this post. Booking your trip as a Flight + Hotel package will probably save you more money than if you were to book separately. Priceline and Orbitz tend to have cheaper package deals than what the airlines usually offer on their sites, so be sure to compare the package costs on several different booking sites to make sure you’re getting the least expensive one. Note: OTAs such as Orbitz and Priceline allow free cancellation before 10 PM CST the day after purchase. As deals sell-out or expire quickly, this policy allows you to “lock-in” the cheap fare while you sort out a plan. After the grace period, you will not be able to cancel without the regular penalty. United, Delta, JetBlue and Virgin America offer free cancellation within the next 24-hours while American allows you to “Hold” a ticket for 24-hours. Keep in mind that once you pay for a ticket on AA.com you can’t cancel it without a change fee or penalty, even if was purchased less than 24-hours ago. The DOT doesn’t enforce 24-hour free cancellation on tickets less than 7-days away from departure, so some airlines and OTAs allow it while some do not. On Orbitz, you can easily see if your ticket allows a free cancellation, just look for “FREE Cancel” next to the price of the ticket. I was able to pull up this fare on Orbitz, and it should be available on other booking sites, but with slightly different prices and flight times. Screenshot taken at 10:02 PM on 01/28/16. Prices and availability can change. Availability: See Calendar. MUST STAY A MINIMUM OF 7 or 9 DAYS. 90 DAY ADVANCE PURCHASE REQUIRED. Example Dates: Barcelona (Orbitz / BookingBuddy) May 17 – May 26 / May 24 – Jun 02 / May 31 – Jun 07 / Jun 14 – Jun 23 / Other dates: Try the +/- 3-day search to on CheapTickets. 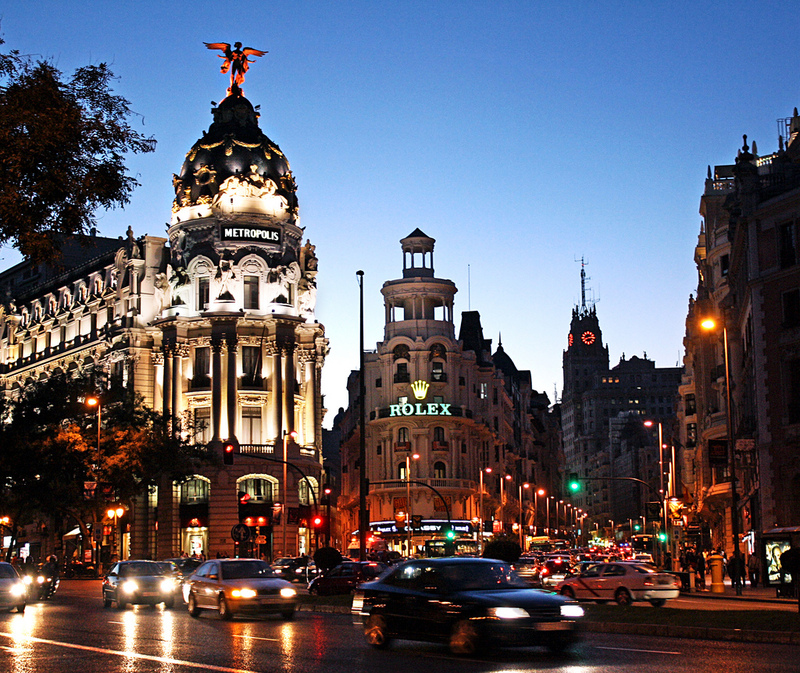 Example Dates: Madrid (Orbitz / BookingBuddy) May 25 – Jun 03 / Jun 01 – Jun 10 / Jun 08 – Jun 17 / Jun 15 – Jun 24 / Jun 22 – Jul 01 / Jul 17 – Jul 26 / Jul 31 – Aug 09 / Aug 17 – Aug 24 / Other dates: Try the +/- 3-day search to on CheapTickets. Mile Accrual: 5 points per dollar. 1.00 PQM. 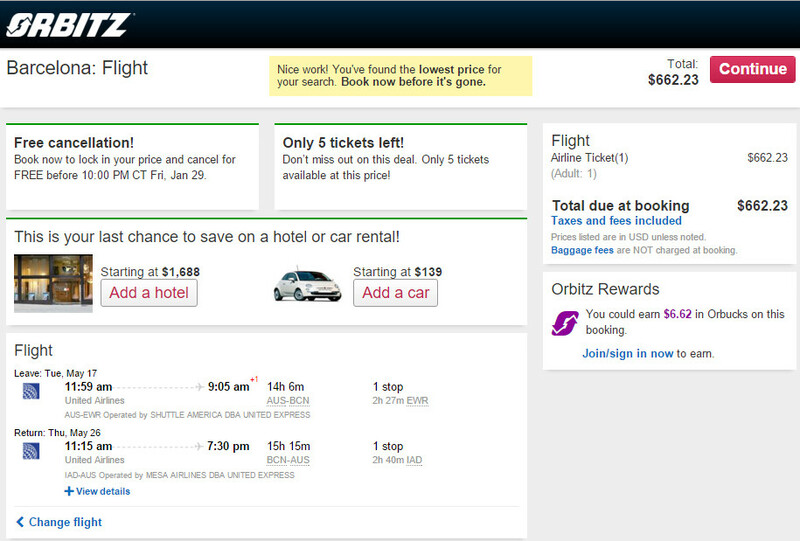 Open this itinerary on: Orbitz, CheapTickets, Priceline, Expedia, Travelocity, Hotwire, BookingBuddy.